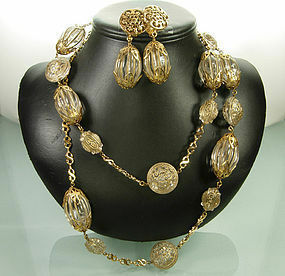 Beautiful very ornate necklace and matching clip earrings by the French maker Monette. I have had one piece by this maker before. Circa 1990. Very large molded Lucite beads are detailed in gold and mounted in heavy filigree caps, and connected with S shaped links. Top quality and beautifully made. Marked MONETTE OF PARIS and MADE IN FRANCE. Necklace is 44 inches long. The largest beads are 1 1/2 inches long. The earrings are 2 1/2 inches long. Excellent condition. One bead at the center has an internal discoloration. Pictured but not noticeable at a short distance and if the necklace is worn doubled as shown it will be at the back and not visible. Price is adjusted to reflect this tiny imperfection. Display form is life size. Photos enlarged to show detail.